What is the healthiest of the seed butters or organic nut butters like almond butter? It depends what you are looking for, but if you are selective, you really can’t go wrong. If you buy artisanal seed and nut butters made from fine ingredients that are organically grown and GMO-free, you are on the right track for good health. Read the labels carefully to ensure that the seed and nut butters are free of harmful hydrogenated oils and cheap fillers. There is no reason for wheat to be added to health butters other than as a cheap thickening agent. Similarly, watch for salt-free and no or low sugar. Those serious about health should be filling their pantries with health butters handcrafted with wholesome and organic nut butters produced in countries you can trust that observe good farming practices. Additional ingredients like organic flax seed, organic hemp seed, and organic chia are all beneficial to health – packed as they are with Omega-3 and Omega-6, as well as protein. 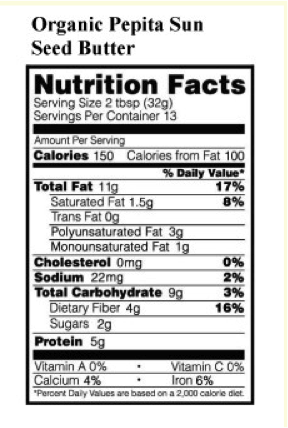 When you scan a nutrition label, be mindful of the serving size. As you can see, one serving of our Organic Natural Almond Butter is a generous two tablespoons coming in at 190 calories. Remember that nuts are healthy fats unlike hydrogenated vegetable oil, an unhealthy fat. For heart health we need to limit our total fat to a maximum of 78 grams each day, no more than 16 grams of saturated fat, and less than two grams of trans fat. This means at 17 grams, our Almond Butter is a safe choice, especially since it contains only 1.5 grams of saturated fat and no trans fats! 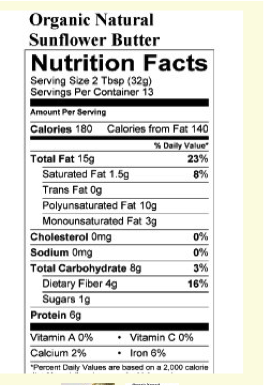 Even better, notice the cholesterol is 0% (300mg is the maximum daily intake recommended). 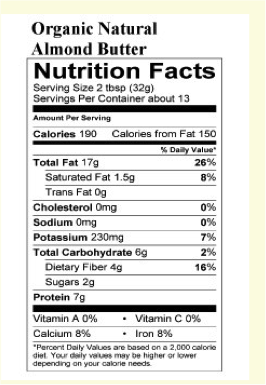 Next on the label you will see an analysis of the fiber and nutrient values. At 16% of your daily intake of healthy fiber (20% is considered high for a serving), two tablespoons of Almond Butter are pretty powerful. As for vitamins, anything under 5% is considered low, so the calcium and iron at 8% are respectable. Now if we look at our Organic Natural Peanut Butter, we see it is the same as the Almond Butter with a two-tablespoon serving size measuring 190 calories. Saturated fats are a bit higher at 10%, but still not excessive and there are no trans fats and zero cholesterol. 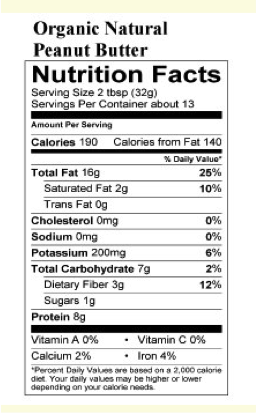 Fiber is 12% daily intake and sugars only 1g. Protein is 8g, while calcium and iron are lower at 2% and 4% respectively. While these numbers are a bit less beneficial than Almond Butter, our Natural Peanut Butter remains a healthy choice. When we examine the Organic Pepita Sun Seed Butter (pepitas are pumpkin seeds), a tablespoon serving is just 150 calories with 17% fat, of which 8% is saturated fat and 0% trans fat. There is still 0% cholesterol, but sodium comes in at a modest 2%. If you’re looking to add fiber to your diet, a serving of this seed butter nets 16% as well as 5g of protein, plus a little calcium and iron. Again, a healthy alternative with many benefits! Examining the Organic Natural Sunflower Butter, you will find that a two-tablespoon serving nets 180 calories with 8% saturated fat and no trans fat. Cholesterol and sodium are 0% while fiber is a healthy 16% and protein 6%. There is additional benefit from calcium and iron. As you can see, Almond Butter gives the most punch for a two-tablespoon serving, but all of these seed and nut butters are quite healthy. Determined to eat well? Visit our online store at Naturally Nutty for delicious and nutritious seed and nut butters made with care from the finest organic and GMO-free ingredients.